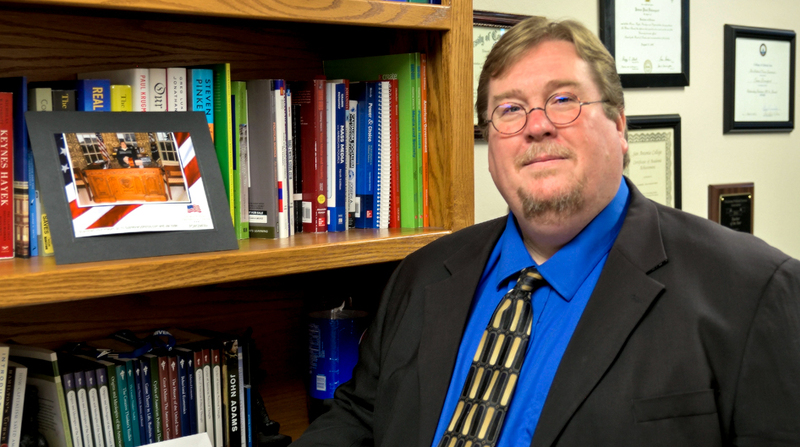 Rose State Political Science Professor, James Davenport, has been selected to serve as President of the Oklahoma Political Science Association (OPSA) for 2019. Davenport succeeds Dr. Christine Pappas of East Central University after serving as Associate Vice President in 2018 and has been a member of the OPSA since 2014. Davenport has also served on the OPSA Executive Committee, as well as the 2018 Chair for the OPSA’s annual conference. James Davenport has been a professor at Rose State College since 2012. He began his time as adjunct faculty before eventually moving full-time in Fall of 2014. Davenport holds a Bachelor’s degree in Political Science from Southern Nazarene University (SNU), a Master’s Degree from the University of Central Oklahoma (UCO), and is commonly interviewed by Oklahoma media regarding local, state and national politics. “My goal as OPSA president will be to increase awareness among policymakers, the media, and the general public of the relevance of our work as political scientists to the variety of issues facing our state and nation. I hope that our members will have greater opportunities to share their knowledge with those in, and out of government,” stated Davenport. The Oklahoma Political Science Association is the professional organization for Oklahoma political scientists and practitioners. The OPSA strives to enable political scientists and practitioners to create an intellectually stimulating environment conducive to teaching, research, and practice in all fields of political science, and its membership includes faculty, government employees, and private sector employees from across the state. The OPSA also publishes a peer-reviewed journal, Oklahoma Politics, each year and in conjunction with holding an annual conference where a variety of awards are presented to faculty and political science students.